LinkedIn is a very important networking tool. Using LinkedIn, you are able to view job openings, employer, and even find contacts at different companies. Most importantly, it's completely FREE to create an account. Please note: LinkedIn is a professional networking sites, and is not intended to be used like Facebook or other social media platforms. LinkedIn provides a comprehensive profile checklist for students. Be professional. This may be how an employer learns about you. It is not uncommon for employers to reach out to potential candidates based on what they see on their profile. Be the best you. Make sure your profile matches your resume. If there are discrepancies between what your profile and resume states, there may be question of the legitimacy of everything else stated on your profile/resume. An example would be the dates of your employment listed your profile for Employer X is different on You do not want the potential employer to lose interest because of a minor mistake. Provide a picture. A profile is not complete if there is no picture. Stay active. LinkedIn is a good place to research companies. Stay active by reading posts, providing comments, and staying connected with alumni and employers. You can also join groups of interest and learn some new things. Connect with as many people you know. The bigger your connections, the larger your network. You will be able to connect and find more people as your connections grow. Communicate with others on a personal level and approach professional as you would any other relationship. Make an effort to learn about the individual and bond with them on a level other than business. Relationships are not solely quid pro quo; humans naturally incline towards caring about one another. This is critical in terms of networking with others, keeping relationships alive and also fostering the personal growth of both parties involved. Informational interviews. Theses informative interviews conducted with contacts you have are a great way to learn more about a field or occupation. In-person at events, conventions, lectures, etc. You can visit our office to learn more about local, as well as nationwide, networking events. E-mail communications. This is perhaps the most convenient way to network with others. Click here to find out the basics of networking via e-mail. On-line communications. Specific social sites, such as LinkedIn, are professional in nature and are a great platform to connect with potential contacts and initiate conversations with others. See a list of additional professional social networking sites that LinkedIn recommends professionals of all age employ during their networking journey. Writing letters and notes. Showing gratitude is something that will never go out of style. Sending and receiving handwritten notes/letters is a rarity in this day and age; make yourself stand out by taking the extra time to thank your contact for connecting with you. To write a successful letter, be sure to include the reason for the letter, the person who referred to you (if relevant), a request to meet the new contact, an assertion of only obtaining information and not requesting a position, followed by a note of gratitude. Over the phone. Do not be shy to pick up the nearest telephone and directly call your desired contact. Make sure to leave your name, number, reason for calling, and thank them in advance for their time. Wherever you meet a contact! There are many organizations locally, regionally, and nationally that offer opportunities to network with other professionals. Below are a few in our area. Keep in mind that networking takes place where ever there are people - churches, civic organizations, sports leagues, golf courses, etc.! 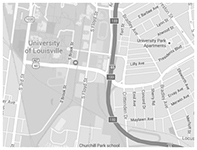 Greater Louisville Inc. (GLI) - is Louisville's local Chamber of Commerce. Chambers of Commerce are associations whose members are businesses and organizations from the local area engaged in promoting the interests of businesses in the region. Check out their Calendar of Events for networking with professionals. EnterpriseCorp - is a division of Greater Louisville Inc. that assists entrepreneurs with business assessment, customer discovery, capital access, talent acquisition, space selection, strategic introductions and peer-to-peer networking. Louisville Business First - is Louisville's weekly business publication. It is a great resource for networking and researching different employers in the region. Check out their Calendar of Events. Their parent company is American City Business Journals which owns 42 other local business publications across the country. Young Professionals Association of Louisville (YPAL) - is a professional and social networking group for 20-and-30 somethings. Check out their Calendar of Events. One Southern Indiana - is the Lead Economic Development Organization (LEDO) and Chamber of Commerce for Clark and Floyd Counties on the Indiana side of Louisville, Kentucky. Network After Work- is a face-to-face networking organization in over 85 cities with over 5 million members. Southern Indiana Women’s Networking Group - provides women entrepreneurs a forum for the interchange of leads, ideas and contacts in the business community. This is achieved by sharing their business experiences and knowledge through regular meetings, a strong network of professional contacts, educational opportunities, and ongoing support.